News - Vulnerable Parts of Permanent Lifting Magnets - Armstrong Magnetics, Inc.
A good permanent lifting magnet should work well for many years when it is always used in accordance with its operational manual. Armstrong Magnetics provides a Limited Lifetime Warranty (10 years) for all models of NL-B and NL-B(2) lifting magnets sold since 1/1/2016. Any operation manual issued by all lifting magnet manufacturers should strongly warn operators not to have the lifting magnets to collide with heavy obstacles while they are in motion. Collisions could damage vulnerable parts of permanent lifting magnets. But which parts are easily damaged in collisions? And what type of these easily damaged parts can survive in a collision? Safety latch is a sliding part which locks the handle at ON position for safety. It is composed of three parts: Sliding Cylinder and L or T shape knob, between them there is a thin steel column. The three parts are welded together. The safety latch is installed at the top or lateral side of permanent lifting magnets and has a chance to be hit by other heavy objects while moving, resulting deformations. The T shape knob of the Safety Latch is floating above the top of the main body. The welding connections of the knob could be destructed in a collision. The level part of the L shape knob of the Safety Latch is lowered into the slot at the top of the main body and therefore the two sides of the slot can protect the knob in case of collisions. 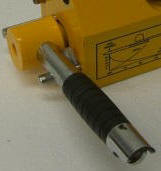 Handle is extruded from the main body of permanent lifting magnet and can easily be hit by any possible heavy items. Handles must be strong enough in order not to be bent in a collision. Some lifting magnets have handles which are made of tubes and a steel bar in the tube. 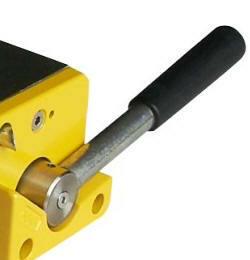 Pressing the bar can move a safety latch in order to lock the handle at ON position for safety. This type of the hollow handle could be easily deformed and not work after a collision. The hollow handle would be easily deformed result from a collision and then the bar inside the tube could not slide and consequently its safety latch could not lock the handle at ON position. The handle is a solid steel bar. It is sturdy and would not be easily deformed in collisions. Permanent lifting magnets are heavy. NL-4400B, for example, weighs 165 lbs. Each time a lifting magnet under a crane lands at a load, the bottom of the lifting magnet could be hit resulting dents, burrs, or even deformations. These dents, burrs, or deformations could establish an air gap between the magnet bottom and the load and therefore the lifting force would be decreased over time.